How much does the altitude at which a cricket (or baseball) match is played affect the flight of the ball? If you’re only interested in the answer to that question, then skip ahead. But there is a reason I am particularly interested in this question, and it has to do with a freakish cricket match played in 2006. Every sport has its fables and epics, and nothing attracts a story like an outlier. In statistics, an outlier is an event that is way out on its own, deviating significantly from the rest of the population. In cricket, for example, the primary statistic that measures how good a batter is is the batting average, defined as the average number of runs per dismissal. The details aren’t required here; it will suffice to say that an average of above 50 in test cricket marks out one of the greats. 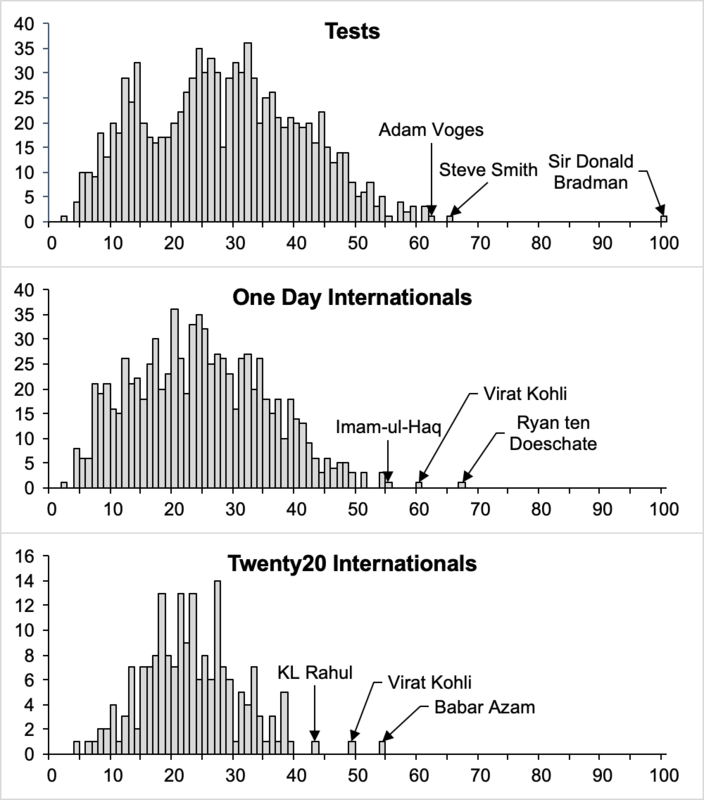 Below (top) is a plot of the batting averages of all those who have played test cricket. We see few players with an average greater than 50, and even fewer above 60. And then comes the outlier, way off to the right – Donald Bradman, with a career average of 99.94. His other career statistics are similarly off-the-scale. The premier achievement for a batter in a match is to score a hundred runs in a single innings, a century. Bradman did it 29 times in his career of 80 innings. Of the 7 batters who have scored as many or more centuries, all required at least twice as many innings. Cricket is one of the few sports in which the question “who was the greatest?” attracts little debate. Cricket has also seen freakish matches. On the 12th of March, 2006, Australia played South Africa in a One Day International (ODI) match. At the time, these two teams were the number 1 and 2 ranked teams in the world. Australia, batting first, smashed the record for the most runs scored by a team in an innings. Their 434 runs easily surpassed England’s 391 against Bangladesh and New Zealand’s 397 against Zimbabwe, totals both reached against much lower ranked teams. Australia’s record stood for just a few hours, as South Africa successfully chased Australia’s total. Their 438 smashed the previous record for the largest chase by 106 runs. The total match runs was higher than any previous match by 179 runs. The “438 match” was quickly proclaimed by both Australian and South African press as the greatest of all time. Cricket statisticians had a field day. In the search for reasons as to why so many runs were scored, some pointed out that the Wanderers Stadium is at an unusually high altitude for a cricket ground, 1633m above sea level. At altitude, the density of air is lower, and so there is less aerodynamic resistance to the trajectory of the ball. Anecdotal evidence suggests that the ball flies further up there. Here, I will quantify this effect. Our model of the flight of a ball (with wind resistance) has a number of parameters: mass and radius of the ball, density of air, gravitational acceleration, drag coefficient and the initial conditions of the throw – height, speed and launch angle. The density of air varies approximately linearly with altitude in the regime in which we are interested. We will vary this parameter only. The figure above shows how much further a ball will travel when hit at altitude, compared to a ball hit with the same initial speed at sea level. As in previous posts, the launch angle of the ball is chosen to maximize the range. in the legend is the distance the ball would have travelled at sea level. 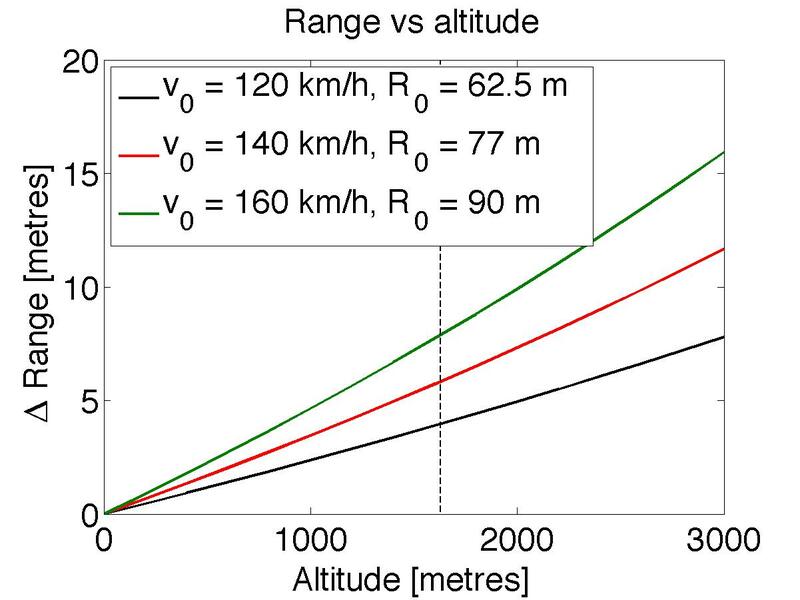 For example, at a height of 2000 m, a ball hit at 160 km/h will travel an extra 10 m, for a total of 100 m. The dotted line shows the altitude of the Wanderers Stadium. The plot shows that a shot that would just carry the boundary at the Wanderers (about 65 m) would land about 4 metres short at sea level. This is not insignificant: a fielder expecting to take an easy catch inside the boundary line would see the ball sail over his head. While this effect alone won’t account for the 438 match, it does show that a higher altitude will help the batter. I wonder whether the reduced air pressure and density would make it harder to swing the ball, making batting a lot easier?? That was a ridiculous match. I can’t believe it was nearly 7 years ago. Doing a postdoc in a non-cricketing nation has thrown me off.